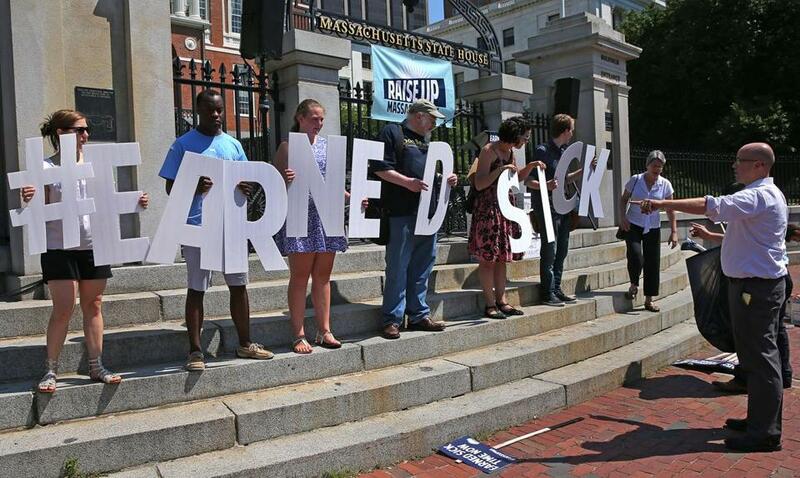 Supporters of the sick time ballot question rallied at the State House June 30. When Rosario Cabrera’s son was in the hospital earlier this year, the New Bedford resident took several unpaid days off from her job as a personal care attendant to be with him — and ended up borrowing money to pay her bills. Barbara Fisher of Hyde Park recently came to work at Dunkin’ Donuts “coughing and sneezing everywhere,” wearing gloves and a mask, because she couldn’t get the day off. Kettly Dehoux had to bring her feverish 10-year-old daughter to work at Logan Airport, propping her up on a couch and sneaking into the break room to check on her throughout the day. With the passage of the earned sick time ballot measure on Tuesday, these workers will no longer have to choose between taking care of themselves — or their children — and paying the bills. Nearly 1 million workers in the state who don’t get sick time — including part-time and temporary employees — will start accruing an hour of sick time for every 30 hours worked, starting July 1. Companies with 11 or more employees will be required to give workers up to 40 hours of paid sick time a year; those with fewer workers must offer unpaid sick time. Only two other states, including Connecticut and California, require employers to offer sick time. 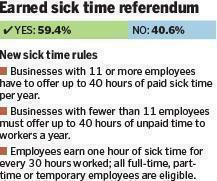 Sixteen cities, including three passing ballot measures Tuesday, also have sick pay mandates. But it is a growing movement that has brought sick time benefits to more than 9 million workers – more than triple the number a year ago. The approval of sick pay measures was part of a wider show of support for low-wage workers in the midterm elections. Voters in four states and three cities passed minimum wage raises for more than 600,000 workers. In two states, voters approved initiatives telling legislators to raise the minimum wage. Only one minimum wage increase, in Eureka, Calif., failed. Even with the additional workers covered by the recently passed ballot measures, about a third of the private sector workforce nationwide doesn’t have paid sick time. Industry groups in Massachusetts, where the minimum wage will soon be the highest in the country, say the additional cost of paying for sick days will hurt job growth. Teen employment, which has declined drastically in recent years, may also take a hit as employers decline to take on the expense of hiring them, industry officials warn. Governor-elect Charlie Baker has said he supports requiring companies to offer paid sick time – but only those with 50 or more employees. Fisher, the Dunkin’ Donuts employee who said she was told to come to work sick, said she was relieved that she would be able to take sick days without being penalized. Fisher, the mother of two, said her hours vary from week to week and she is often scrambling to make ends meet.